Our women's puffer jacket are selling out quickly. Grab them before they're gone! 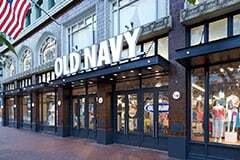 The women's puffer jacket at Old Navy has emerged as a real alternative to wool coats with its casual, hip style. Typically quilted with a smooth shell, puffer coats offer cozy linings, sometimes fleece, and performance insulation. More body conscious than a parka, this jacket is the perfect choice for casual events and running around town. If you remove the sleeves, you get even more options. Our puffer vest for women have been coming on strong in fashion circles because they're so versatile and allow cute outfits to show. In fact, vests often become part of the outfit and aren't removed at all. Ideal for cool weather, the vest provides warmth that's not overwhelming and its light weight makes it easy to wear. Quilted jackets have come a long way since their introduction when they were overstuffed and concealed the body. Today's insulation holds more heat with far less bulk and has transformed the look of down jackets. They no longer detract from your look by making your body seem overstuffed, they add to your style. 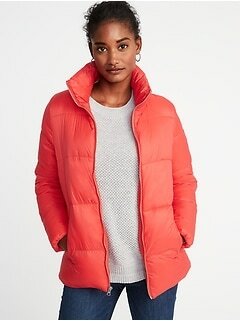 Available in so many colors from neutrals to brights, puffer jackets belong in every girl's closet. Variations include the addition of faux fur, hoods, and pocket styles from snap button to smooth. There are full length versions of these women's insulated jackets, and one of the latest twists is the use of fabric like woolen plaids instead of the typical polyester coating. Puff jackets are easy to wear because they're the statement. You might want to add a scarf for warmth or a hat, but the style is so cute, it's enough on its own. These coats also tend to last a long time, so you'll get a lot of wear out of the jacket you choose. Choose a color that says "wow" to get attention and if your style is up to the minute. Try a more muted tone if you're more traditional and classic in style. Whichever outerwear you pick, it will become one of your go-to pieces all winter.